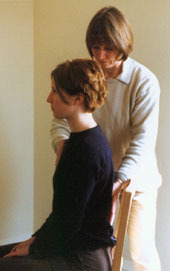 Back Pain: It is an effective way of addressing the mis-use cause of much back pain. Breathing: Asthma and other breathing difficulties are helped, including its effect on depression and anxiety. Stress: Stress has many causes but generally involves the "startle reaction" pattern of mis-use. You can learn to inhibit the over-use of this reaction in everyday situations, and feel so much calmer generally. Posture: may be causing a wide range of problems from migraines to painful knees. Depression: Depression causes a lot of "pulling down" physically and emotionally. The Alexander Technique can help you to change these mental habits. Pregnancy and Childbirth: Helpful throughout this time of great change and adjustment. Music and drama: Professional musicians have long recognized the stress involved in performance as well as in daily rehearsal of voice or instrument, and have benefited from AT being an established part of Music and Drama courses. Sport: Perform better without injury. At whatever level of participation or competition, AT enables you to enjoy well co-ordinated movement. 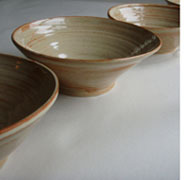 Potters and artists: Pottery requires both strength and delicacy. It involves a wide variety of lifting, strong pressure, repeated sideways movements and light free hand movements. Many potters experience bad backs, necks, or wrist problems and many of them consider these strains to be inevitable and unavoidable. AT sessions are available in your own studio or at mine in Clevedon. "Applying the Alexander Technique I have learned has helped me both play with a greater freedom and produce a more fully focussed sound"
Please note that no medical diagnoses are made.